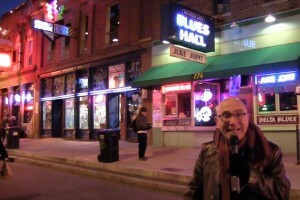 In January 2014, I went down to Memphis, Tennessee to be a judge in the International Blues Challenge (IBC) and also to perform a set for the Blind Raccoon showcase. It was my first time down there and I had a blast. The feeling of community and fellowship in the Blues was certainly prevalent throughout the week. I highly recommend that you attend whether you are a Blues lover or not. One thing that struck me was the enthusiasm for the Blues that exuded from the musicians and from the fans. This gave me an idea, an epiphany of sorts. I wanted to find out where this passion for the Blues comes from. Armed with a video camera I decided to ask them. Initially I thought that maybe only a few people “might” be interested in coming in front of the camera for an interview. Boy was I wrong. The response from the Blues community at the IBC was overwhelming. In just a couple of days, we filmed over 50 interviews and got some interesting perspectives. Based on these interviews, we created a series of 13 web episodes on “Why I Love The Blues”. We posted one episode a week beginning May 28, 2014. Subscribe on Youtube at my channel https://www.youtube.com/marshalllawrence and go to the Why I Love the Blues Playlist. Thanks to everyone who participated in this project. Keep on Bluesin’ my Brothers and Sisters !!! !